Next week, DC-area Starbucks locations will replace all their "men's" and "women's" bathroom signs with gender-neutral ones. The move is a big step for trans rights, and more businesses should follow Starbucks's example. Amanda Hess of TBD writes that according to DC's Human Rights Act, businesses have to "allow individuals the right to use gender-specific restrooms and other gender-specific facilities such as dressing rooms, homeless shelters, and group homes that are consistent with their gender identity or expression." 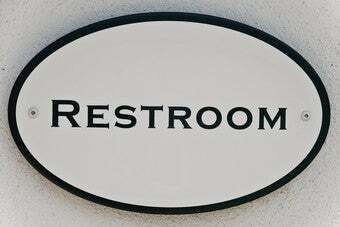 And businesses with single-stall bathrooms are required to use "gender-neutral signage" — by, for instance, "replacing signs that indicate 'Men' and 'Women' with signs that say 'Restroom.'" this seems like a no-brainer — why on earth should using a single-stall bathroom be a situation where people have to declare their gender identity? But lots of DC businesses still have gender-specific signs, and last year two LGBT groups began campaigning to get businesses to follow the law. Starbucks, with its 52 locations in DC, has lots of visibility and power, and DC's Office of Human Rights called its decision "a significant step forward for individuals whose identity or behavior differs from stereotypical or traditional gender expectations." The transgender student at the center of this story wanted to fit in with her classmates and use the same bathroom as all the other girls. Indeed, while making more gender-neutral bathrooms available can help many transgender people, a transgender person should still be allowed to use the bathroom based on their gender. In an essay in Gender Outlaws: The Next Generation, Evin Taylor lists 50 question for determining cisgender privilege. The very first one is, "Can you be guaranteed to find a public bathroom that is safe and equipped for you to use?" The Starbucks decision is a key step — but until everyone can answer yes to this question, there's more work to be done.